Salons are synonymous with beauty, relaxation and pampering. Sometimes, though a visit to your favorite nail tech or hair stylist can go terribly wrong and you end up hurt. Salon injuries do happen. Think about it, there are scissors, razors, electric appliances plugged in near sinks and chemicals galore at any given salon. The most common salon injuries are burns, from things like curling irons, hair dryers, waxes and even chemicals (hair dye). For the most part, these are minor incidents but more serious harm can be done, like permanent hair loss and scarring. If you have been burned, cut or injured in any way at a salon you can seek damages for negligence. First, you'll have to prove that the beauty salon and/or employee failed to act according to reasonable standards of care to help prevent the injury. Typically you can seek compensation for medical expenses, pain and suffering and in some cases, mental anguish. If you were injured by an appliance that malfunctioned (i.e. a hair dryer), you may have a case against the manufacturer for product liability as well. 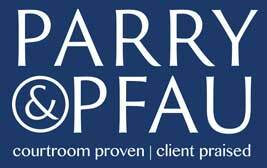 If you've been injured at a salon contact Parry & Pfau today. We can help counsel you on your rights and what actions should be taken. Remember, some salon injuries go unreported because the victim is embarrassed about what happened. Do not let embarrassment get in the way of you receiving the compensation you need.